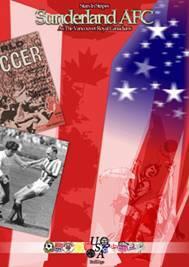 In 1967 Sunderland AFC embarked on a trail blazing tour of North America. From New York to Toronto, Dallas to San Francisco; Jimmy Montgomery, Cecil Irwin and a host of our stars took on the best that the United Soccer Association could muster. Imported teams from Brazil, Uruguay, The Netherlands, Scotland, Ireland, Italy and England were recruited en masse to represent various franchises as the North Americans set out on the long road to forming a professional league. In time the efforts of Vancouver Royal Canadians (Sunderland AFC), Toronto City (Hibernian), Washington Whips (Aberdeen) and others would result in the formation of The North American Soccer League, giving rise to such teams as The New York Cosmos featuring giants of the game such as Pele and George Best. Here is the story of this pioneering and long forgotten campaign in 1967, never before fully told, with complete results, attendances, round by round league tables, features on the stadiums, match reports, full page rare programme shots, player profiles and much more. Whether you are a fan of The Black Cats, Dundee United, Cerro, Bangu, Shamrock Rovers, Glentoran, Aberdeen, Wolves, Stoke City, Cagliari or Den Haag, this Blue House Field publication has something for you. As an additional bonus there is also a write up on each season during the 1960’s with a feature on Roker Park during the 1966 World Cup. With a limited edition of just 375 publically available copies Stars In Stripes is priced atthe special rokerpark.com price of £9.99 including postage and packing. All copies will carry a Certificate Of Authenticity and will be personally signed and numbered by the author. To obtain your copy (overseas enquiries, e-mail 1879@sky.com) send a cheque made payable to Paul Days to 3 Holmlands Park, Chester le Street, County Durham, DH3 3PJ. Paypal is also acceptable to 1879@sky.com Include all contact details.